Is it possible to use DualIso in conjunction with the experimental set-up with 45 fps and 1920x1080? How do you go about? How do you set it all up in the camera? I tried with SD card, i tried with EOS utility 3 but it doesnt work. Who could help me please ? I finally succeed to downgrade until 1.3.3 but cannot go to the 1.2.3 for Magik lantern ... Any ideas ? Sorry if this question seems ignorant, but what is the highest widescreen resolution (16:9, 2:35, 2:39) one can achieve with the crop_rec module in 14-bit lossless, continuous 24fps, while having the LiveView fully functioning during recording? I'm trying to get 45fps as described in the build notes: "1920x1080 @ 45p and 48p (3x3 binning)…Continuous:…1920x1080 @ 45p"
Closest I can get (15ish seconds run) is 1920 x 818 (2.35:1) or 1456 x 820 (16:9) on a Lexar 1066x 128gb. Have tried various combinations of Global draw on/off; Video Previews; Sound off. Nothing seems to hit the stats in the notes. Could someone suggest some tweaks please? Are you recording into SD or CF card @timbytheriver? Hiya! Record into CF card. (Lexar 1066x 128gb) I have ML on SD card. Many thanks! Does that build include all the other modules from the build Jul22.2018 from the 'Experimental' page? That build was for 1.1.3! I got a message warning me about it as soon as I put it in the camera! Is there one for 1.2.3? Set to ntsc for 48fps I think. I think I got contnuous this way. You might have a bad card. You can check your card against benchmark.mo. Just get that module from any other build. @Danne NTSC/60fps produced lots of code errors and stopped immediately. Set back to PAL. BTW: Benchmark run writes a BENCHx.PPM file to card's root. You may convert it to PNG to avoid second cam. Which numbers do you get with plain nightly build in photo mode? Can't see the BENCHx.ppm file anywhere on CF or SD card. Run another benchmark with plain nightly build in photo mode and report back. @ Walter Schulz Thanks for looking that over. I guess I'd better contact the seller (Amazon) for a replacement. "The Lexar Professional 1066x 128GB CompactFlash card offers high performance and large capacity. It supports UDMA-7 and it rated at 160MB/s read and 155MB/s write speeds according to Lexar. The large capacity is ideal for video recording, and it carries the Video Performance Guarantee rating of VPG-65, meaning the card will sustain at least 65MB/s continuous write speed." 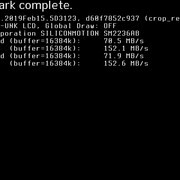 Is that figure of 65MB/s quoted the one the ML bench test is giving (61MB/s in my case)?. No .ppm files anywhere to be seen! Is it to much asked for another benchmark run in photo mode with plain nightly build instead of jumping to conclusions? I don't quite understand "run in photo mode". What's the correct procedure for running the ML benchmark test? Your cam has two modes: Photo/stills and movie/video and there is a switch right to the eye-piece with respective symbols. Do not enter liveview in photo mode for this benchmark run. Is mv720p or mv1080p also affecting benchmark results? If so set it to mv1080p when testing as well.